A set of sparkling windows will brighten any room in your home. Unless you’re an interior design professional, however, choosing the right style to suit your space can be tough. Murphy Home Improvement in Cincinnati, OH, can help you navigate the overwhelming world of window options. Here, they explain two of the most popular styles: single- or double-hung windows, and sliding windows. Single- or double-hung windows operate by sliding vertically. A single-hung window has a fixed upper sash and a moving lower sash. A double-hung one has movable upper and lower sashes, which allow for greater versatility. Sliding windows operate by running horizontally along a track in the window frame. They may or may not include muntins—the strip of wood or metal that visually divides panes of glass. Size: Since sliding windows don’t require lifting, they tend to be larger, permitting more expansive views and allowing additional light to come in. That being said, hung windows score points among home improvement experts for their aesthetic appeal and can be nicely lined up in rows to maximize sunshine. Temperature Control: Sliding windows can be more securely sealed, which helps regulate temperatures indoors and can save you money on heating and cooling costs. Hung windows, on the other hand, are well suited for window air conditioner installation. The AC unit can be placed where the lower sash would usually fall. Cleaning: Slider windows are easy to clean, since the moving pane can be popped out for washing purposes. Single- and double-hung windows can also make for easy cleaning, provided you get tilt-in sashes. 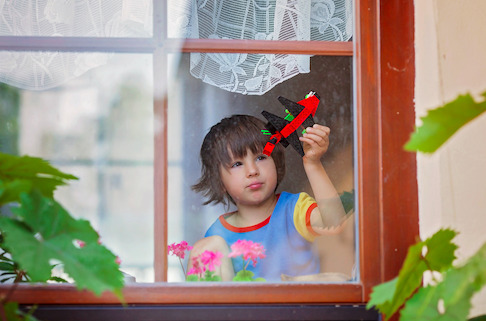 Safety: Parents and pet owners may prefer single- or double-hung windows due to safety concerns. You can lock the lower sash while opening the upper one, keeping curious critters and kids safe while still allowing ventilation. Still not sure which style is best for you? Consult the professionals at Murphy Home Improvement in Cincinnati, OH. You can find out more about their window installations online. Better yet, stop by their showroom in person: Come with your window measurements in hand, and you’ll get a 10% discount. If you have any questions, give them a call directly at (513) 922-8989.